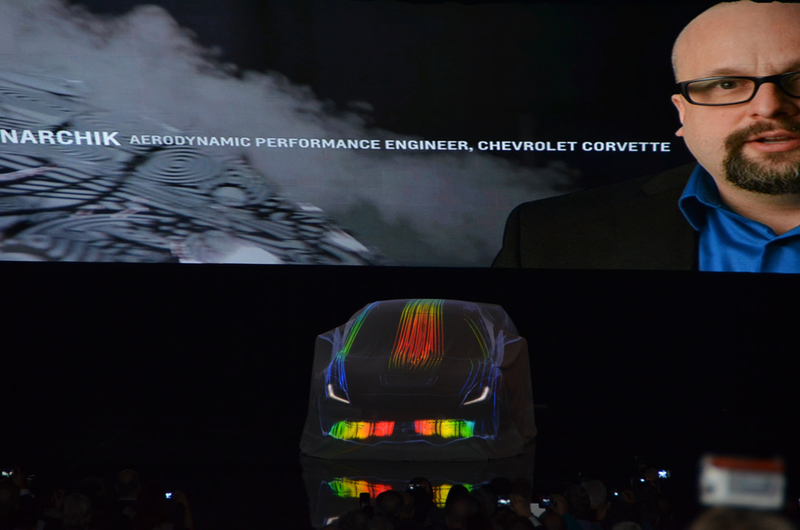 The Corvette Action Center takes an up close and personal look at the C7 Corvette and interviews the key players behind it. For more detail, click on the following images for an expanded view. Suddenly the lights dimmed within the Russel Industrial Center and the enormous crowd of guests and media came to a dead silence. 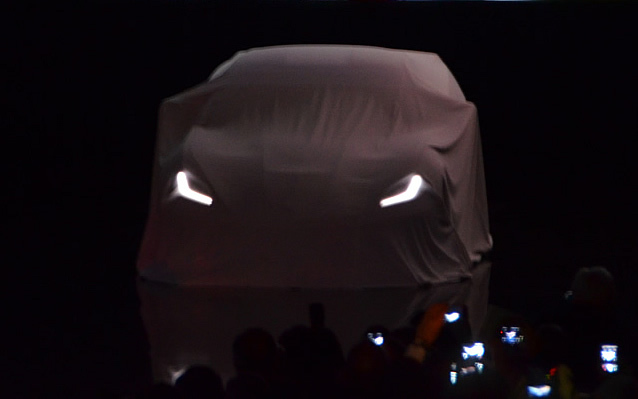 Directly in front of me, the faint, ominous glow of the C7 Corvette's LED DRLS gently outlining the front-end of the car from behind a curtain. 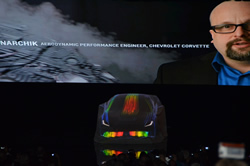 Overhead, the large screen TVs began showing interview clips of various GM personnel explaining some of the highlights of the newest Corvette sitting patiently behind the curtain. Tadge Juechter - Chief Engineer/ Vehicle Line Director - Corvette: We looked everywhere in the car to see what was the latest and greatest technology that we could use. Harlan Charles - Corvette Product & Marketing Manager: Things like Active Handling, Stability Control, and Performance Traction Management; things like that can actually make a very experienced driver do even better on the track; actually improve their lap times, so the technology is there for you to use or turn off if you don't want to. 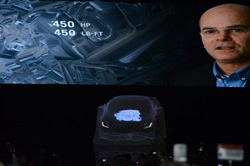 Tadge Juechter: People that go for their first drive in the new Corvette are going to notice everything is different. 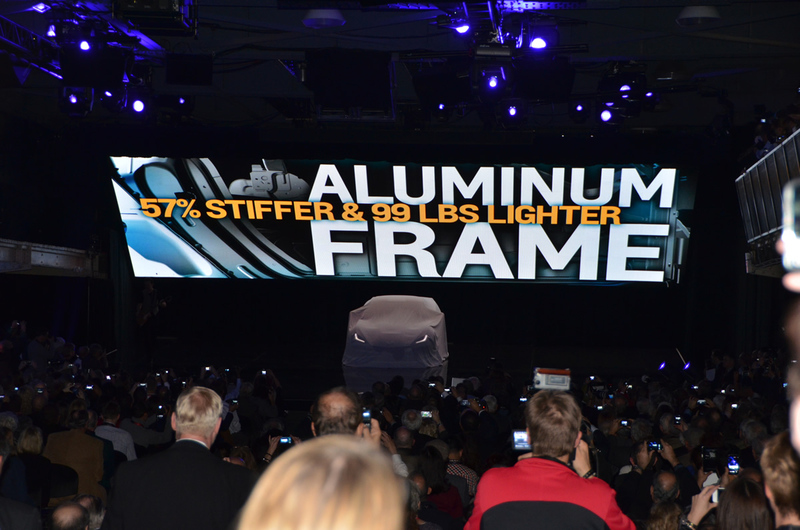 The body structure is almost 60% stiffer than the car we sell today. That makes the car feel really planted to the road; extremely solid; extremely secure. We were actually able to take 99lbs (45kgs) out of that structure. We've used state-of-the-art aluminum construction in the entire frame and much of the chassis. 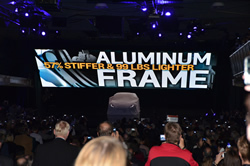 The 2014 C7 Corvette Stingray's frame - picture taken at the North American International Auto Show. 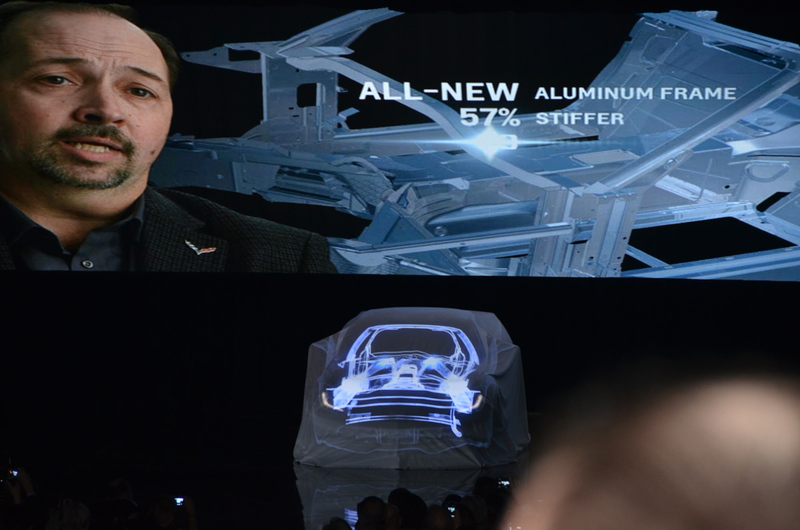 Tadge Juechter: This is the first time that we're bringing carbon fiber all the way down to the entry vehicle. We use it on the hood and the roof because we want to take weight off the front and off the side panels of the vehicle to drive the center of gravity down. The breakthrough on this car is really around the engine. The fundamental greatness of the small-block V8 is its compact size, high output, very low mass, and is a huge enabler for the sports car. 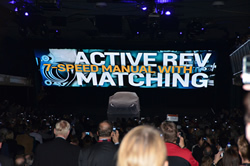 Our Active Rev Managing is one of our most transforming changes we made for the driving experience. As soon as you start to move the shifter towards another gear, the vehicle recognizes that and quickly blips the throttle to get the engine to the speed it needs to be at. If you change your mind and move to another gear, it senses that immediately and will quickly move the engine to that speed so you have a very seamless, transparent downshift. 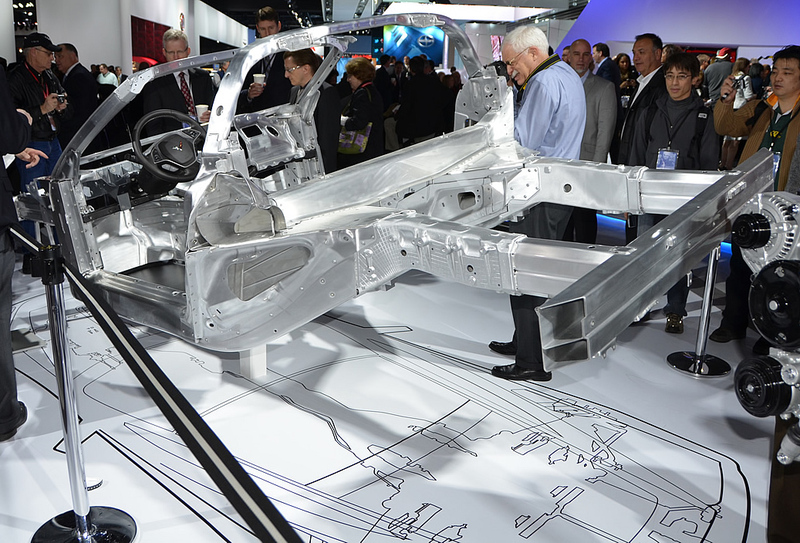 Cars are becoming enormously complicated. One of the things we've tried to do is simplify that whole matrix of technologies, and have the car easily customizable to any particular situation or driver want. So one of the things we've done is integrate all of those different features into a single function; it's a driver-mode select which affects 12 different attributes of the car. 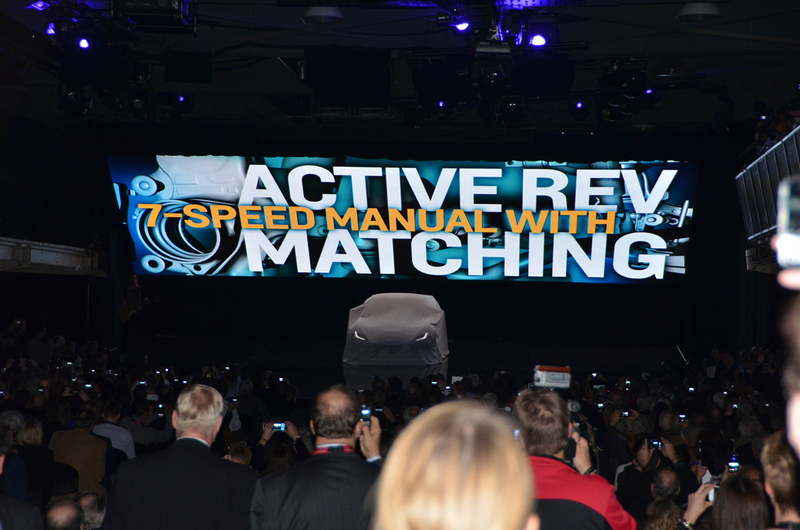 Harlan Charles: (That driver mode select) affects 12 different attributes of the car. Some of those are Magnetic Selective Ride Control, the exhaust sound, the transmission shift pattern, and the electronic throttle control. And we have five modes going from most conservative to most aggressive. 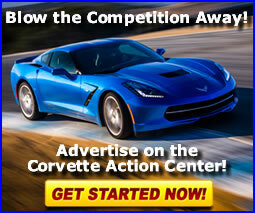 So if you love driving the Corvette is really the car that will take you to that next skill level. Tadge Juechter: We've actually improved the steering stiffness of the whole system from the tips of your fingers on the steering wheel through the column, the steering gear, the chassis, out to the tires. We've actually increased the system stiffness five times, so 500% stiffer. 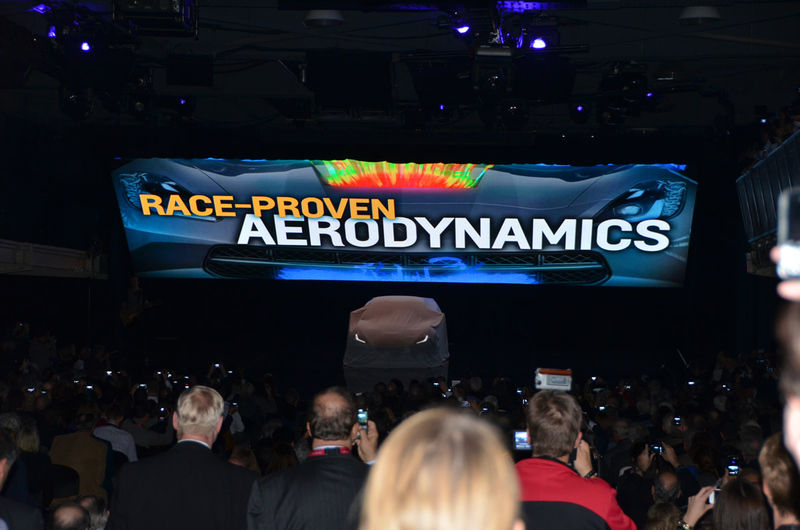 When you design cars that are as capable as Corvette, aerodynamics is not an option. You see a forward tilted radiator with a function outlet in the hood. That's to route all of the hot air that goes through the radiator over the top of the car instead of underneath the car. Virtually every race car uses this solution and virtually no street cars do. Ed Welburn - GM Vice President, Global Design: The new design, in some ways, is a far more international design. It's in many ways, a very exotic design true to Corvette roots, but it's like it's grown up in many ways.